Consumer Reports gets lots of feedback from readers who feel tricked by big companies - and the magazine loves nothing more than going to bat for them. Consumer Reports is at it again, this time scouring supermarket shelves for gotchas! Food shopping is leaving a lot of people with that empty feeling. Used to getting a pint when you buy ice cream? You may have to reduce your expectations: Many are now just 14 ounces. These ice-cream sandwiches used to be packed 12 in a box. Now you get ten for the same price! "It's called downsizing, and people feel duped by the practice," said Tod Marks, Consumer Reports. As a reporter for Consumer Reports, Marks is a shopping expert who fights for the little guy. "Companies often blame downsizing on rising labor and ingredient costs. But it's a way for them to raise prices, too, without being noticed," Marks said. Take juice, for example. Expecting to find a half-gallon in all these containers? Well, some store brands still contain the traditional 64 ounces. But many of the big brands are now only 59! These three jars of peanut butter appear to be the same size. But they range from 18 ounces down to 16. That's a difference of roughly two servings. Even laundry detergents have shrunk. This All liquid is 50 ounces, while this look-alike bottle of All Free Clear is only 46 and a half ounces, which means two fewer loads. How about two extra-large Hershey's bars? Would you expect one to be slightly smaller? Buy Ivory soap as a 10-pack and you get 4-ounce bars. Pick up a 3-pack and they weigh only 3-point-one ounces. "The best thing you can do is to read the fine print on the packaging. And pay attention to those unit-price labels on most store shelves," Marks said. Consumer Reports says the problem comes down to one of perception. For years, many products came in clearly recognizable sizes: a pound of coffee, a quart of mayonnaise. Today that's not true. 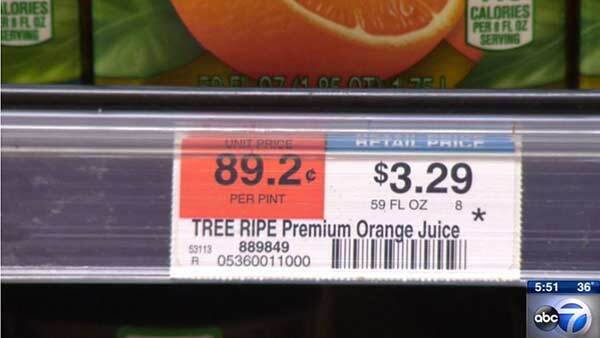 So you need to check the label to see how much of the product you're actually getting.